A favorite of caterers for its compact size and ability to hold hot or cold food for 4+hours,the 300MPC neatly fits in the back of small cars. The Cambro Camcarrier is a solid product that will make your catering much easier! 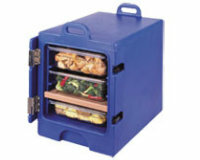 Transport hot or cold food safely for 4+hours,without electricity. Holds 3 full-size4″deep food pans.